Over the years, we have taken on various projects both large and small. Some are large houses which take many months to construct. Others are limited to just one room, and may take only a few days. Regardless, we treat every project with equal importance. These are some pictures of other various projects we have completed. 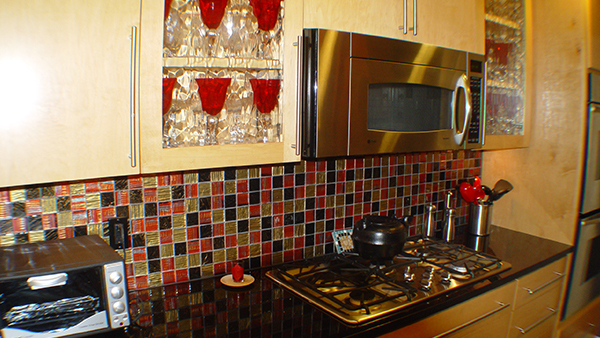 In 2011, we were pleased to have the opportunity to remodel a kitchen for the Harris family. This was a unique project because it combined a look of antiquity with a modern flare. Cabinets maintained a rustic appearance while flooring and countertops were modernized. 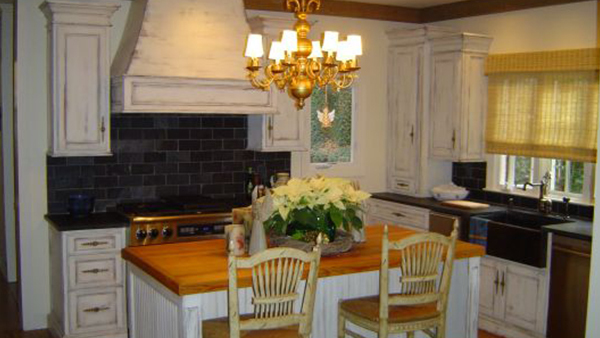 A hanging chandelier helped to give the kitchen a quaint atmosphere. The project was also complemented with a wine rack combined with a small bookshelf. This particular project allowed us to take a plain eating area and give it an eclectic sense of flare! 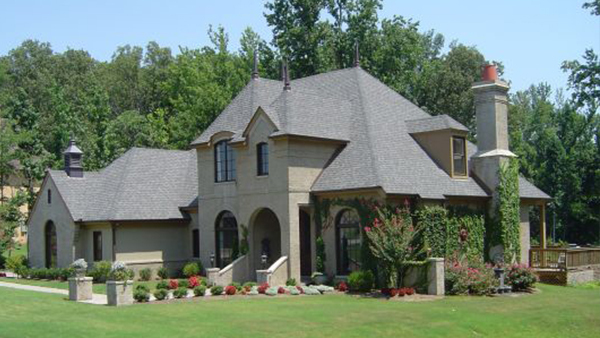 The Austin project was another upscale custom home which we constructed from start to finish in 2011. This was a two-story structure constructed on a larger wooded lot. We were pleased to provide the owners with the home of which they could be proud! This home included marble countertops, iron railing for the staircase and special designs in the flooring. Chad Austin has been our go to Air & Heating specialist through the years and when he and his family decided to build a custom home out in Fayette County of course we were happy to do this for him. Everything was carefully selected from outside to the inside. 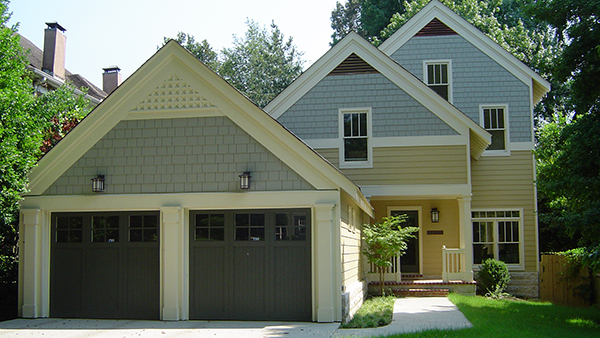 We brought the same care and attention to detail to their home that we bring to all of our projects. The home features a beautiful large front porch to take advantage of the beautiful wooded lot it sits on. It was a huge success for us and the Austin Family. Western Fayette County continues to serve as one of the fastest-growing areas in Tennessee, and the Woodsedge subdivision is a prime example of the type of upscale growth that is taking place. The Woodsedge subdivision boasts of large wooded lots, underground utilities, strict architectural controls, and protective covenants with restrictions. A homeowners association also exists to help preserve the scenic beauty and atmosphere of the development. 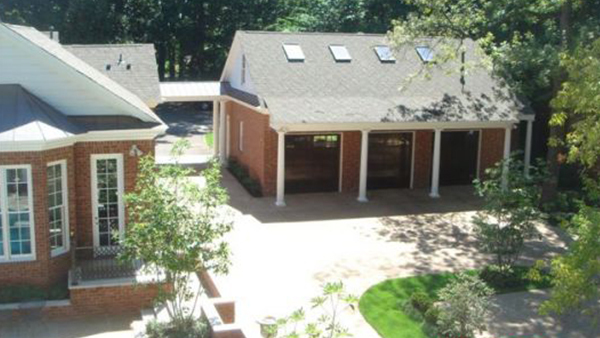 A custom built home on 2.3 wooded acres coming in just under 5,000 sq. ft. total, this house had four bedrooms, three bathrooms and an additional half bath, and a huge bonus/entertainment room. It also included a three-car garage, formal dining room, high-end kitchen, breakfast area, library, and large living room. We were pleased to complete the project with a beautiful and spacious home of which the owners could be proud. The French County was the name given to Lot #101 because of the plans chosen after months of searching for the perfect plan to fit the lots unique character. Every detail was pored over before we even broke ground. 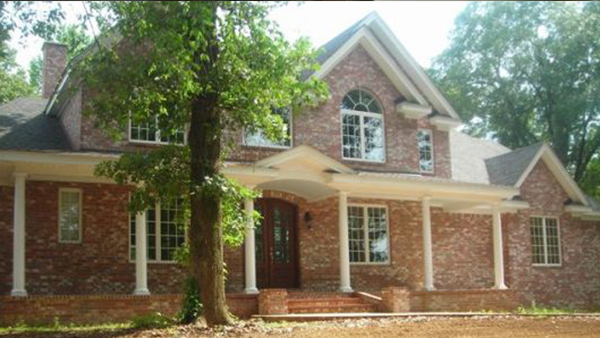 Our desire was to build a house that would stand the test of time and meet our high standards. Quality went into every detail of this home. During the project we made several adjustments to make the home even bigger and better, pushing out walls and adding in unique spaces as you can see in the video and pictures. We were very happy and proud to hear the owners tell us that we had built their dream home. Nearly ten years later, they still live in this home. We signed the closing papers just before Thanksgiving, in November 2006. We broke ground in March of the same year, right at nine months from start to finish. We documented every step of the process which you can see by clicking here. You can also watch this video that capture the full journey of the project, click here to watch. Midtown Memphis is a diverse mixed-use area of the city. It is the home of many cultural attractions, educational institutions, and unique pieces of architecture. It is also recognized as the location of Memphis’ traditional medical district. Multiple historic districts are located in this part of town, so it was important to be conscientious of the surroundings when we acquired this project for a property owner on Jefferson Street. For this particular project, we began with a demolition of the existing structure and then constructed an entirely new dwelling. This provided the owner with confidence that his new home would be structurally sound. The final product was a two-story home, with a functional two-car garage, which blended well with the surroundings of the neighborhood. For nearly twenty years, Ray and Mary Gill lived contentedly in their Yorkshire Forest home, circa 1939. In 2006, however, they determined that it was time to improve their quality of life and expand their living space. They decided to add two spacious wings on either side of the house, two large garages for automobiles, an exercise room, and a guest house that would overlook the swimming pool. The two- year project was completed in 2008, and the Gills were extremely satisfied with the final product. Throughout the project, our company worked very closely with homeowner Ray Gill to ensure that the sentimental touch was maintained. The home had originally been built on family-owned land by his grandfather, Cordra York Sr. It was very important to maintain its historical character, as seen in its living room mantel, banister, Corinthian columns, doors, and other various architectural elements. Thousands of bricks were hauled to the site from Washington in an effort to ensure that each new brick matched the size and color of those used in the original structure. Random-width oak floors were cut in order to match the beveled edges of the old floors. Moldings were also custom-made, and porthole windows over the guest house were designed to match those over the home’s entrance. Following the project’s completion, the Gill home was spotlighted in the July 2011 edition of Memphis Magazine. Click Here to read the full article.